Quality, passion and innovation are key values for Gi.Metal. 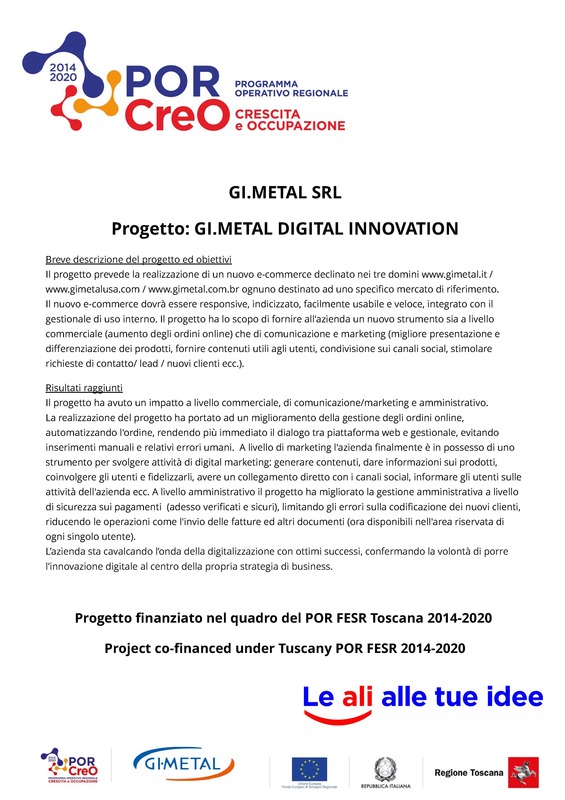 A thorough study and analysis of the final consumers needs and requirements, a consistent search for innovative raw materials and the high quality of the services provided, have made Gi.Metal famous all over the world, along with its highly appreciated pizza peel, an essential tool for pizza restaurants worldwide. Our products stem from over thirty years of expertise in our field; still, we haven’t stopped experimenting and exploring possible new solutions. A thorough and consistent research into cutting-edge, last generation, new materials and relevant investments in the optimization of our production processes, allow us to continuously enhance the quality of our products, and to reach the level of excellence Gi.Metal is so proud of. Gi.Metal offers a wide range of pizza peels and baking peels. We have invented, patented and manufactured the first ever perforated pizza peel, which enables users to get rid of residual flour before putting pizzas into the oven. A high tech material such as carbon, is matched with aluminium for the creation of a light, elegant and “emotional” tool featuring an extraordinary finish. A highly innovative protective and strengthening coating, an exclusive anodizing treatment by Gi.Metal, makes the surface of the company pizza peels extremely resistant to heat, corrosion, scratches and heavy wear and incredibly smooth, with the additional benefit of highly antibacterial and anti-mould properties. A whole range of lightweight, highly resistant and flexible pizza peels which has been created to satisfy the requirements of even the most demanding pizza makers: rectangular, round, and “by the meter” with smooth or perforated or embossed surfaces, handles in a set of sizes, different materials and for different types of ovens. A range of products designed for pizza makers who work Neapolitan style, with high-temperature ovens and really high frequency use. Enhanced materials, exclusive round holes, laser cut, which make these products absolutely unique. America line was born to enhance the work of american pizza makers preparing their traditional pizza pies. A unique combo of tradition new materials and lastest technology. Made in Italy and Us approved. Amica Line A range designed for private users who are after high quality, light and easy-to-handle tools for their occasional use. In addition to pizza peels, Gi.Metal also produces other professional tools for pizza makers to be used for the different phases of the work: from the preparation of the dough to the baking stage, from the cutting to delivery and transportation, and to the clearing and servicing of ovens. Gi.Metal produces professional restaurant trolleys for restaurants, hotels, canteens, pizza restaurants and bakeries. We are talking about products ensuring functionality, resistance, lightness, comfort, reliability and durability. To achieve such results, Gi.Metal employs only the best materials available on the market such as stainless steel of a European origin, 100% nickel free to prevent allergies. Read and download the latest Gi.Metal catalogueto find out more about the outstanding features of our products, the materials they are made of, and, obviously, our pricelist.